India announced a new National Mineral Policy (for non-coal and non-fuel minerals) in early April, after two-and-a-half years of wrangling between mineral-rich states and the central government, between steel-makers, iron ore miners and exporters. The objective of this policy, nmp -2008, is clear it will promote privately-owned, large-scale, mechanized minesif they happen to be controlled by multinationals, still better. Lack of foreign direct investment (fdi) in the mining industry was the very reason the 1993 national mineral policy was revised. But the casualty of this exclusive focus on fdi is the env ironment and social issues. The policy treats them as hindrances, rather than an integral part of mining. nmp -2008 ignores the fact that mining in India is not only about minerals and a simple dig and sell proposition, it is about tribals and backward castes and their land and livelihood alienation. It is about poverty, backwardness and Naxalism. It is also about deforestation and biodiversity impact, water security and pollution. A majority of Indias minerals lie beneath its forests. The top 50 mineral-bearing districts alone account for about one-fifth of the forest cover of the country. Some of the most dense and biologically rich forests are in these districts. These districts are also tribal-dominated and among the poorest in the country. Eighty per cent of these districts are affected by Naxalism. These districts are where some major rivers originate and flow through. The new mineral policy not only sidelines most of these facts, but also paints a false picture of mining in the country. For instance, the policy believes that the miner will leave the mining area in a better ecological shape than he found it in. This is scientifically wrong and technologically impossible. Mining destroys biodiversity and the top soil and leaves behind a big water-filled void in the earth along with hill-sized waste dumps. Even when the policy states that reclamation and afforestation should proceed along with mineral extraction as far as possible, it does not make the concurrent efforts mandatory. To promote mining, the policy has also made blatantly false statements. It states mineral development has made substantial contribution to the development of mining are as. This when 70 per cent of the top 50 mineral-producing districts are among the 150 most backward districts of the country even after decades of mining. Despite all the rhetoric about the employment potential of mining and tertiary sector spin-offs, the fact is that modern large-scale mining does not need local people. It needs local resourcesminerals, water, forests, land and existing infrastructure. It ends up alienating local livelihoods, but cannot replace them. This is the major point of conflict between miners and local communities across the mining belt of the country. Added to this is a huge trust gap between the mining industry and the government on one side and the community on the other. The mining industry has poor rehabilitation and resettlement record. It is estimated that not even one-fourth of the people displaced by mining have been resettled. The result is that people in mineral-rich areas are not willing to give up their land for mining. In such an environment of acute discontent and distrust, the solution nmp -2008 offers is to follow the government resettlement and rehabilitation policy and to rely on corporate social responsibility (csr). It is just not going to work.In fact, with large-scale mining, one should expect large-scale social unrest in the countrys mining belt in the coming years. As far as protection of the environment is concerned, nmp -2008 has essentially copied the prescriptions of the older policy. There is, however, a difference. nmp -2008 plans to mitigate the environmental and social fallouts of mining by relying on a voluntary mechanism, Sustainable Development Framework (sdf). 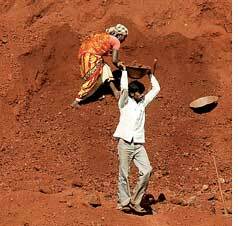 It wants mining companies to voluntarily practise csr. It is important to understand from where sdf has come into the policy. Under fire for their poor environmental, social and human rights records in developing countries, the worlds leading multinational mining companies decided in 2001 to promote an organizationInternational Council on Mining and Metals (icmm)to improve their image. With the help of the International Institute for Environment and Development, London, icmm came out with a social and environmental wish-list, which it wanted its members to comply with voluntarily. sdf is this mechanism. It mandates an annual report on mines social and environment performance to be verified by private auditors. The problem with the framework is that it is no different from existing voluntary certification systems like iso 14001. Its principles are so broad, vague and qualitativefor example, contributing to social, economic and institutional development of communitiesthat companies could claim they adhered to them without doing much. The reporting and verification process is also farcical companies can write what they want because the verifiers are paid by them. In India, mining companies are supposed to submit annual environmental audit reports and half-yearly progress reports on environment management plans. Given that this mandatory system has failed, it is unlikely that a voluntary one will help make mining sustainable. In short, nmp -2008 not only wants to privatize mining, it also proposes to privatize environmental and social regulations in mining. Even its innocuous-sounding free-market prescriptions to speed up the mining process will entail huge environmental costs. 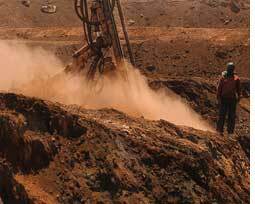 The concept of seamless transition from prospecting to mining will render environmental and forestry regulations meaningless. Seamless transition means if a prospector has found an ore body, it will be obligatory on the government to give a mine lease. This means that even if the ore body is found in an ecologically sensitive area, the government will be bound to allow mining there. Similarly, security of tenure without any oversight clause can also be construed as security to continue mining even when the mine has created severe environmental and social problems. This will make the mine renewal process redundant. nmp -2008 has failed to take cognisance of the fact that mining is creating huge environmental and social problems because laws and institutions assigned to regulate it have failed. There is a multiplicity of regulations and regulatory institutions, but most regulatory institutions do not have a capacity to regulate mines. The entire environmental governance in miningfrom the granting of lease to the mining operation to the ultimate closure of minesis a series of paperwork, with little impact on the ground. The countrys debilitating institutional capacity for managing environment is further compromised by the fact that the policy prescribes no deterrence for non-compliance. Instead, nmp -2008 relies on sdf to solve all problems, which has not worked anywhere in the world. The 1993 mineral policy failed partly because its progressive guidelines related to mineral conservation, enforcement of mining and environment management plans, mine closure, rehabilitation and the privileges of the Scheduled Tribes were never implemented in the right spirit. nmp -2008 merely reiterates these guidelines without specifying the mechanism for their implementation. For example, similar to the previous policy, nmp -2008 states that mining operations shall not ordinarily be taken up in identified ecologically fragile and biologically rich areas. This means under special circumstances this provision may be circumvented. Besides, the government has not identified ecologically fragile and biologically rich areas to declare them out of bounds for mining. Similarly, the new policy reiterates that efforts will be made to convert disused mining sites into forestsofficially, there are 500-odd orphaned mines in the countrybut offers no mechanism of doing so. The focus of the new policy is to make the regulatory environment in the mining sector conducive to private investments. nmp -2008 concludes that mineral wealth is a major resource for development and its economical and timely use are matter of national importance. There is no mention of giving equal importance to safeguarding the environmental and social concerns of the people. nmp -2008 is so ambiguous and open-ended that bureaucrats will have a field day converting the policy into law. They will put some parts on the back-burner and interpret others to suit mining interests. This was precisely the way the High Level Committee on National Mineral Policy (Hoda committee) instituted by the Planning Commission went about its job. In the end, we will be left holding a law that will promote large-scale mining, but will have no laws or institutions to address its negative impacts. This is no assumption, but a real-time scenario because this is exactly what happened to the 1993 national mineral policy.